Set up your fishing trip here! What days are you looking to fish? Have you ever heard of or seen a Redfish? Redfish, also known as red drum, is one of the most popular fish sought in the Gulf of Mexico. The fish is primarily an inshore fish and is a popular game fish. Other names include spottail, red bass, and channel bass. Found inshore and offshore, redfish spend the majority of their life near estuaries and are not long distance travelers. This type of fish is a cousin of black drum and does interbreed, creating hybrids. Some interesting facts to note, redfish can live over 40 years and weigh as much as 50 lbs. By 3 years, redfish weigh between 6 and 8 lbs. Once the fish grow to be over 27-inches, they are called bull reds. The speed of growth varies by age of fish and habitat, but males reach maturity between 1 and 3 years and females between 3 and 6 years. Beautiful to behold, redfish are known for their distinctive dark red backs, gradually fading to white on the belly. Alternate colorations include deep black, copper, and near silver. Redfish have a characteristic eyespot near the tail. More than one spot is common, and it is rare for a fish not to have spots. Similar to many fish varieties, redfish are streamlined with an elongated body. They have a blunt snout, sloped head, and pores on the head, snout, and chin. Although a drum species, redfish lack chin barbels. Adult redfish have a seasonal diet, feeding on crabs, shrimp, and sand dollars in the summer and menhaden, mullet, croaker, and flounder in the winter. They use their downturned mouths to bottom forage through biting and vacuuming. Their powerful jaws allow redfish to break through the shells of crustaceans. The habitat and migration of the species extends from the coasts of Massachusetts to northern Mexico, living in both temperate and tropical zones. When searching for redfish, look in coastal areas with sea grass and salt marshes, which are among their preferred habitats. 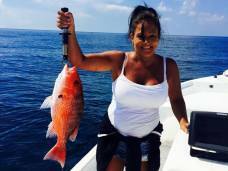 A Gulf Shores fishing adventure is waiting for you. It’s time to get your Fish On! One word! Awesome!!!! He Worked hard to make the trip the best it could be. Went above and beyond what he should have. He let us sit there and watch the blue angles practice when he didn’t have too. Are time was up. 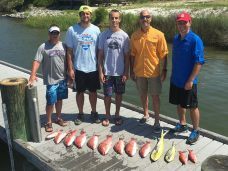 Great fishing trip! Something I will never forget. Thanks Scott!! Best fishing charter myself and kidos have had. Captain Scott is great and excellent in helping kids, could not have been any better. I would recommend him to anyone that wants to go fishing!!!! Thank you Captain Scott. 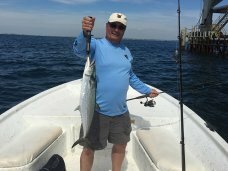 Truly enjoyed the experience and Captain Scott's experience in locating the fish and we caught a variety of fish. Plan to do it again the next time we return. Thanks!